Apogee Industries provides blank labels to customers as a result of the large growth of thermal printers, laser printers (both monochrome and color), and now ink jet printing for both cut sheet and roll labels. With these printers, customers are able to print labels for their applications on their own; however the label selection is critical to the success of the project. Apogee consults with customers to make sure they are getting the correct label solution. Will the labels be auto or hand applied? Do you have to comply with GHS (Global Harmonized System) standards or the BS 5609 standard within GHS. Apogee Industries manufactures custom blank labels in house on presses designed to produce blank labels. Our facility includes three other large, 8 color presses to print the labels for customers who need color label printing. For more common sized or standard blank labels Apogee will carry stock on many of these labels which can be ordered directly with quick delivery times. 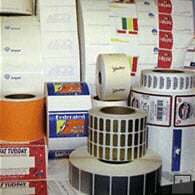 Many small to medium sized companies from the chemical, food, and household goods industries have been making labels in-house on their own thermal printers, ink-jet printers, or laser printers and Apogee has been there to consult them with their equipment (printer) decisions. Apogee will help you make the right decision regarding decisions for label printers and blank labels. We will also advise you what not to print yourself and let Apogee print it for you. Equipping you with knowledge, information and confidence to make the right decision is what we do!